My artwork is the expression of how I perceive the ephemeral place where human meets landscape meets animal. It is a place where everything is constantly changing - whether with the seasons, with our impact on this planet or our growing understanding of the universe. I am compelled to explore this spiritual territory for myself and it is my deep hope that the art that flows out of this exploration touches someone else, as well. These are the philosophical things I think about as I work, but it is also a process lead simply by my enjoyment of handling these materials and the magical things that they do naturally, without much intervention from the artist. 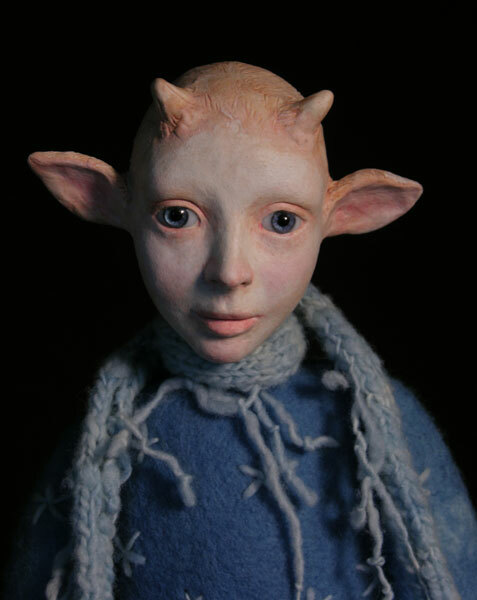 My goal is that the viewer may feel more whole as they appreciate the subtle organic colors and shapes that come from using natural materials like wool and plant dye or that their heart breaks open for a split second as they look into the sculpted face of one of the delicate beings who lives in this realm. I work primarily with the human form, putting emphasis on face and hands because they are capable of simultaneously hinting at and masking the thoughts and feelings inside. Fine detail creates a sense of fragility and an expression of quiet introspection which harmonizes with the rich tactile nature of wood, wool and stone. It is a joyful meditation and a challenging journey of discovery to start with raw materials such as fleece and clay and to bring them to a finished state that has spiritual meaning for me. The body of work that I am currently immersed in is sculptures of beings that symbolize the intersection of earth, man and beast - archetypal witnesses, guardians and mystics. I feel that the work is a synthesis of my professional experience as a realist portrait painter, my academic experience studying transpersonal psychology and Buddhist meditation and my own personal sojourns through woods, fields and dreams. I am influenced by nature, icons and relics, Jungian psychology, comparative religion and whatever my hands and heart tell me they want to make. Thank you for looking - I hope you enjoy!